HAVANA (AP) — Raul Castro handed over Cuba's presidency Thursday to a hand-picked 57-year-old successor he said would hold power until 2031, a plan that would place the state the Castro brothers founded and ruled for six decades in the hands of a Communist Party official who remains little known to most people on the island. Castro's 90-minute valedictory speech offered his first clear vision for the nation's future power structure under new President Miguel Mario Diaz-Canel Bermudez. Castro said he foresees the white-haired electronics engineer serving two five-year terms as leader of the Cuban government, and taking the helm of the Communist Party, the country's ultimate authority, when Castro leaves the powerful position in 2021. "From that point on, I will be just another soldier defending this revolution," Castro said. The 86-year-old general broke frequently from his prepared remarks to joke and banter with officials on the dais in the National Assembly, saying he looked forward to having more time to travel the country. In his own half-hour speech to the nation, Diaz-Canel pledged to preserve Cuba's communist system while gradually reforming the economy and making the government more responsive to the people. "There's no space here for a transition that ignores or destroys the legacy of so many years of struggle," Diaz-Canel said. "For us, it's totally clear that only the Communist Party of Cuba, the guiding force of society and the state, guarantees the unity of the nation of Cuba." He said he would work to implement a long-term plan laid out by the National Assembly and Communist Party to permit moderate growth of private enterprises like restaurants and taxis, while leaving the economy's most important sectors — energy, mining, telecommunications, medical services and rum- and cigar-production — in the hands of the state. "The people have given this assembly the mandate to provide continuity to the Cuban Revolution during a crucial, historic moment that will be defined by all that we achieve in the advance of the modernization of our social and economic model," Diaz-Canel said. Cubans said they expected their new president to deliver improvements to the island's economy, which remains stagnant, dominated by inefficient state-run enterprises that are unable to provide salaries high enough to cover basic needs. The average monthly pay for state workers is roughly $30 a month, forcing many to steal from their workplaces and depend on remittances from relatives abroad. "I hope that Diaz-Canel brings prosperity," said Richard Perez, a souvenir salesman in Old Havana. "I want to see changes, above all economic changes allowing people to have their own businesses, without the state in charge of so many things." But in Miami, Cuban-Americans said they didn't expect much from Diaz-Canel. Sixty-five-year-old Lourdes Diaz, who left Cuba as a child in 1955 before Fidel Castro, said life on the island will be "exactly" the same under the new president. Julio Cesar Alfonso, president of Solidarity Without Borders, called the change of leadership a "farce." "It's a cosmetic change," said Wilfriedo Allen, a 66-year-old lawyer in Miami who emigrated from Cuba in 1961. "The reality is that Raul Castro is still controlling the Communist Party. We are very far from having a democratic Cuba." After formally taking over from his brother, Fidel Castro, in 2008, Raul Castro launched a series of reforms that led to rapid expansion of Cuba's private sector and burgeoning use of cellphones and internet. Cuba today has a vibrant real estate market and one of the world's fastest-growing airports. Tourism numbers have more than doubled since Castro and President Barack Obama re-established diplomatic relations in 2015, making Cuba a destination for nearly 5 million visitors a year, despite a plunge in relations under the Trump administration. Still, the Soviet-style command economy employs three of every four Cuban workers and produces little, while private sector growth has been largely frozen since last year. Foreign investment remains anemic and the island's infrastructure is falling deeper into disrepair. The election of President Donald Trump dashed dreams of detente with the U.S., and after two decades of getting Venezuelan subsidies totaling more than $6 billion a year, Cuba's patron has collapsed economically, with no replacement in the wings. Castro's moves to open the economy have largely been frozen or reversed as soon as they began to generate conspicuous shows of wealth by the new entrepreneurial class in a country officially dedicated to equality among its citizens. His inability or unwillingness to fix Cuba's structural problems with deep and wide-ranging reforms has many wondering how a successor without Castro's founding-father credentials will manage the country over the next five or 10 years. "I want the country to advance," said Susel Calzado, a 61-year-old economics professor. "We already have a plan laid out." With Castro watching from the audience, Diaz-Canel made clear that for the moment he would defer to the man who, along with his brother Fidel, has ruled one of the world's last communist governments since 1959. 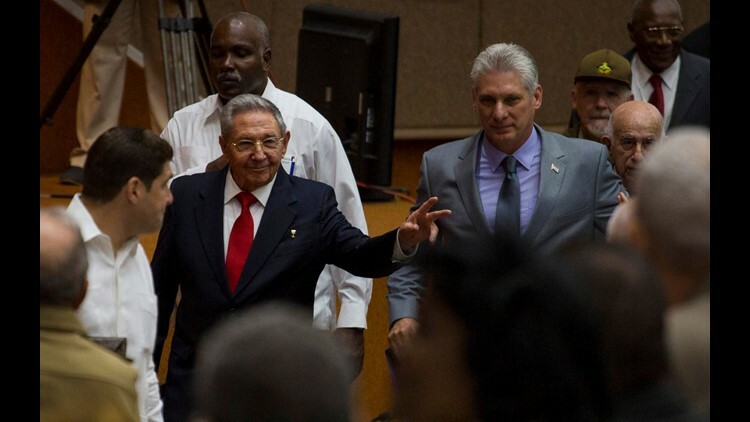 "I confirm to this assembly that Raul Castro, as first secretary of the Communist Party, will lead the decisions about the future of the country," Diaz-Canel said. "Cuba needs him, providing ideas and proposals for the revolutionary cause, orienting and alerting us about any error or deficiency, teaching us, and always ready to confront imperialism." Most Cubans have known their new president as an uncharismatic figure who until recently maintained a public profile so low it was virtually nonexistent. That image changed slightly this year as state media placed an increasing spotlight on Diaz-Canel's public appearances, including remarks to the press last month that included his promise to make Cuba's government more responsive to its people, language he echoed on Thursday. Diaz-Canel gained prominence in central Villa Clara province as the top Communist Party official, a post equivalent to governor. People there describe him as a hard-working, modest-living technocrat dedicated to improving public services. He became higher education minister in 2009 before moving into the vice presidency. At the U.S. State Department, spokeswoman Heather Nauert expressed disappoint at the handover, saying Cuban citizens "had no real power to affect the outcome" of what she called the "undemocratic transition" that brought Diaz-Canal to the presidency. Cuban state media said Russian President Vladimir Putin congratulated Diaz-Canel and thanked Castro for the many years of cooperation between the two countries, while Chinese President Xi Jinping also reaffirmed his country's friendship with Cuba and expressed interest in deeper ties. In a video of a Communist Party meeting that inexplicably leaked to the public last year, Diaz-Canel expressed a series of orthodox positions that included somberly pledging to shutter some independent media and labeling some European embassies as outposts of foreign subversion. But he has also defended academics and bloggers who became targets of hard-liners, leading some to describe him a potential advocate for greater openness in a system intolerant of virtually any criticism or dissent. International observers and Cubans alike will be scrutinizing every move he makes in coming days and weeks. As in Cuba's legislative elections, all of the leaders selected Wednesday were picked by a government-appointed commission. Ballots offer only the option of approval or disapproval and candidates generally receive more than 95 percent of the votes in their favor. Diaz-Canel was approved by 604 votes in the 605-member assembly. It was unclear if he had abstained or someone else had declined to endorse him. The assembly also approved another six vice presidents of the Council of State, Cuba's highest government body. Only one, 85-year-old Ramiro Valdez, was among the revolutionaries who fought with the Castros in the late 1950s in the eastern Sierra Maestra mountains. Associated Press writer Ben Fox contributed to this report.